Following the first Democratic debate, Fox News and the broader conservative ecosystem erupted in a coordinated effort to paint the Democrats as frivolous spenders, handing out free stuff to everyone without bothering to discuss how they'd pay for it. However, the irony of this attack is thick, given how the Democrats have taken up the burden of fiscal responsibility in the modern era. The Republican Party has no choice but to dig deeply into the history books to find the last GOP president who actually bothered to leave the deficit in better shape than when he was inaugurated. Meanwhile, President Obama, like President Clinton before him, has seen the federal budget deficit fall by record numbers. According to a new report from the Wall Street Journal's Market Watch site, the federal government ran up a deficit of $439 billion for the 2015 fiscal year. That's 2.5 percent of GDP, which is the lowest level since 2007. Why is this significant? The Obama administration inherited a $1.4 trillion (with a "t") budget deficit -- driven in large part by stimulus spending meant to combat the financial crisis -- which authorized George W. Bush in October 2008. Since then, Obama has presided over a gradual $1 trillion-dollar reduction in the deficit. Insofar as deficit reduction is important -- and remember, according to the rhetoric of the GOP over the past several years, it is very important -- this is a massive achievement for the Obama administration. Massive. And neither he nor the Democrats will get any credit for it. 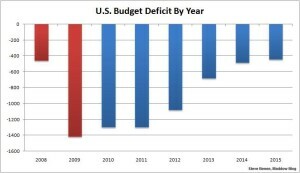 If Mitt Romney's lies about the deficit in 2012 were a predictor of the GOP's attack plan for 2016, we can expect to hear the Republican ticket attack both Obama and the Democratic nominee on this very issue. But they won't cite deficit numbers because, well, they're not nearly as dumb as they look. Instead, they'll recycle the Romney tactic of conflating the deficit and the national debt -- two entirely separate numbers. For example, Romney said during his first debate against Obama in 2012: "The president said he’d cut the deficit in half. Unfortunately, he doubled it." Well, no. The deficit wasn't "doubled" at all. It was the debt that rose, but analysts have repeatedly shown that the chief drivers of national debt were George W. Bush's wars, Medicare Part-D (a Bush-era policy) and the impact of the Great Recession -- none of which was offset with higher taxes or spending cuts. Obama can hardly be blamed for all that. Not insignificantly, though, the Obama administration's deficit reduction has slowed the growth of the debt. In fact, the year-over-year increase in the debt has slowed to 10 percent. Compare that with the highest growth rate for the debt ever -- 13.4 percent per year under, yes, Ronald Reagan. We'll circle back to comparing the records of recent presidents in a second. 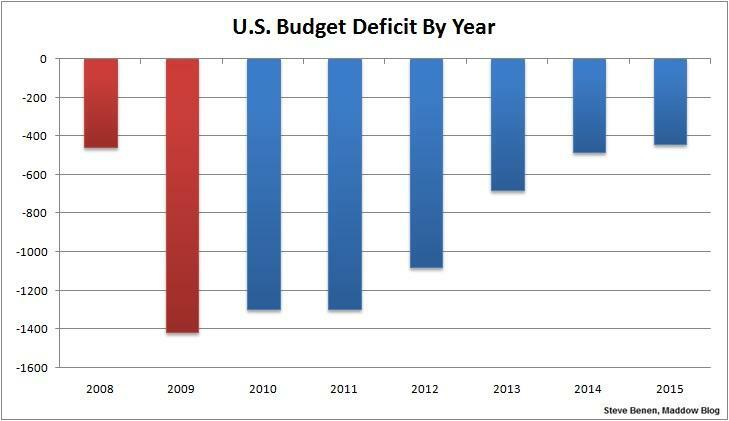 Meanwhile, contra Romney, Obama promised to cut the deficit in half, and he did. It took him five years instead of four, but he did it. Suffice to say, when you hear the GOP talk about government spending, listen for their deliberate swapping of the terms "deficit" and "debt." They do it a lot. How exactly did Obama manage to slash the deficit so drastically? It's true that Republicans have controlled the House of Representatives since January 2011 (along with the Senate this term) and those years have been marked by aggressive GOP attempts to roll back the welfare state, punctuated by episodes of legislative brinksmanship that ultimately resulted in the dreaded sequester. But that only tells a part of the story. Nearly every bill signed by the president has included offsets to make the spending deficit neutral. Why? Because it's been the law of the land ever since President Obama signed the Statutory Pay-As-You-Go Act in February 2010, which mandates that new spending be offset with spending cuts or new revenue. Yes, a Democratic president and a Democratic Congress passed this legislation. Guess how many congressional Republicans voted for the law. Zero. Not one. I can name two Democratic presidents who've cut the deficit through the duration of their presidencies: Clinton and Obama. And what about Republican presidents? Bush 43? He turned a $200 billion surplus into a $400 billion deficit by the end of his first term, and a $1.2 trillion deficit by the end of his second term. Bush 41? Nope. Reagan? No. Ford? No. Nixon? No. The last Republican president who cut the deficit was Eisenhower. Along those lines, the recently introduced tax plan of the Republican frontrunner, Donald Trump, would explode the deficit by as much as $10 trillion over a decade. Tell me again: Which is the party of fiscal responsibility? A caveat: It's true that Congress, not the president, passes the federal budget, and that the recent Republican-dominated Congresses have been particularly vicious where non-military expenditures are concerned. But if the president is to be blamed for the size of the deficit -- and reminder: Obama is being blamed, at every opportunity -- then it's only fair and intellectually consistent that he should get credit when the deficit is reduced. Furthermore, and not to bury the lede, but there's no reason the deficit needed to shrink this rapidly. Given the depth of the Great Recession, government spending could've done more to stimulate the economy. That said, there's this GOP-based obsession with deficit reduction as an indicator of political success even though governments can operate quite well with short-term deficits. Accepting, though, that deficit reduction is a political reality, the Democratic record is galactically better than the GOP on this front. Numbers don't lie.